Enjoy hours of nighttime entertainment without the hassle of building and feeding a traditional campfire, all with just a single log. What better way to celebrate the end of summer than with a good old-fashioned campfire, surrounded by friends and family, singing songs and roasting marshmallows? But when you play host to a backyard bonfire, you take on plenty of responsibility, from chopping logs in the afternoon to using them to grow the fire all night long. Fortunately, there’s an easier alternative that will keep you from having to mess with all that kindling—and it requires only one log and some starter fuel. Swedish soldiers used this ingenious method for heating and cooking during the Thirty Years’ War, from 1618 to 1648. Now, nearly 400 years later, the single-log setup (sometimes called the Swedish Fire Torch) is easy to light and even easier to control. Unlike with the classic campfire, there’s no need to stack sticks or constantly feed the fire while worrying about keeping the flames contained. Here, the fire burns within the log, leaving much less work for you and much more time to serve up s’mores. 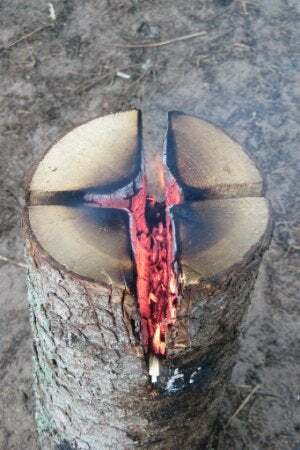 To make your own Swedish Fire Torch, find a single seasoned log—the thicker, the better. The log will need to stand upright, so select one with flat ends, or use a chainsaw (or ax) to level both the top and bottom. Next, with the log standing on one end, make two to three cuts across the top of the log, only partway through, creating four to six wedges as if you were slicing a pie. Make each cut from the top of the log down toward the bottom, leaving about six to eight inches of uncut wood at the base. If the log splits completely or seems a little unstable, dig a small hole in the dirt and fit its base in there for extra support. Then, place a bit of fuel—oil, tinder, paper, or kerosene—directly into the cuts. For safety reasons, avoid using gasoline due to its volatility. 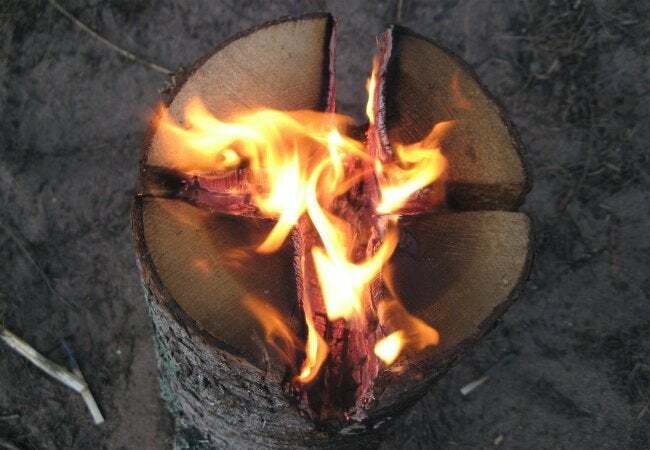 After you ignite the fire, a small flame will shoot out of the top of the log then die down gradually. When it does, your log will continue burning from the inside and out through the top. Depending on the type of wood and the size of the log, the fire will burn from two to four hours without any need for extra kindling. You can use the glow to illuminate the evening’s activities, or employ the one-log wonder as a compact, natural stove. (The log’s flat top is the perfect surface to hold a kettle or cast-iron skillet filled with your favorite campfire cuisine.) Whatever you do, above all, remember to take it easy.